Baby Quilt - Finally a Finish! Holy Cow! Has it really been more than three months since my last blog post? I guess that's what happens when you mix work, grad school and summer together. I admit, I haven't had the time to do much sewing, but I did manage to get this quilt finished back in June to give to my wonderful cousin before she had her adorable son. 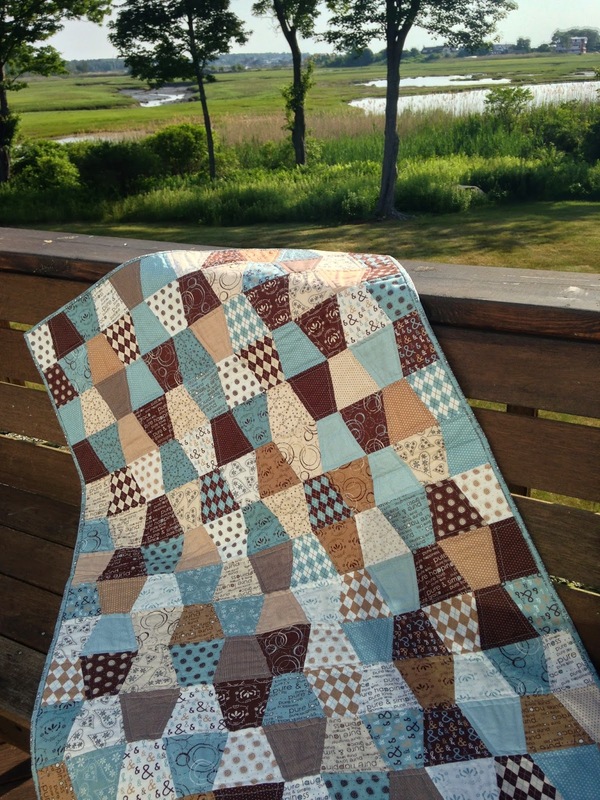 I got a lot of the piecing done at retreat back in March and slowly finished piecing the quilt together and quilted it, echoing around the tumbler blocks in the months after. I cut the tumbler pieces out using four charm packs and my tumbler die for my AccuQuilt using some Pure charm packs I had lying around. It was a big accomplishment to get this one done in time for the baby shower. The final stitch went into the binding the morning of! My other cousin is having a baby in December, so I guess I should get moving on that one. Actually, I might turn my Michael Miller challenge quilt into that baby quilt since I'm still working on that.